Well Halloween is officially over. 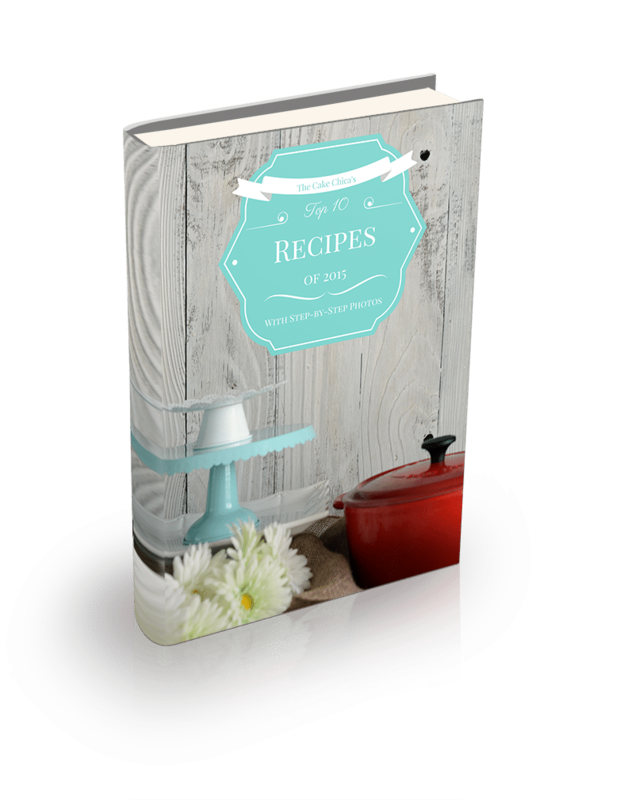 Now is the perfect time to start researching what pies to make this holiday season! 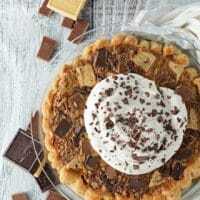 I think this Chocolate Chunk Pecan Pie is one you’re going to love! 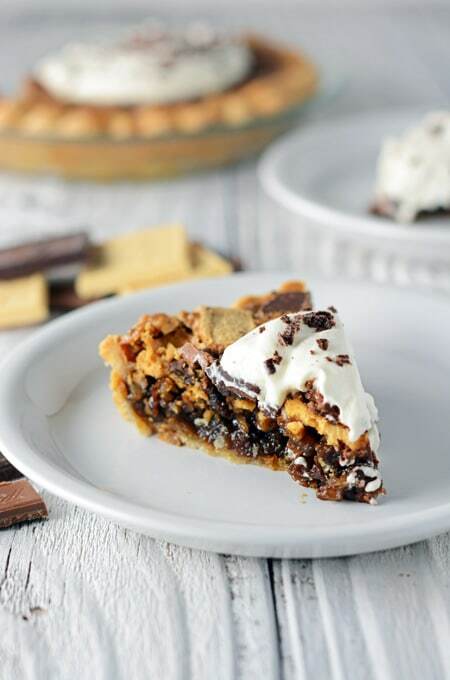 This Chocolate Chunk Pecan Pie is perfect if you like your pie a little less sweet. For so long I’ve always thought that pecan pie just wasn’t for me. Many times they are too sweet and the crust seems a little soggy and at one point in my life I just swore it off. But after learning some tips from America’s Test Kitchen, I now know that whole soggy crust thing is easily fixed by making sure your warm pie filling goes into your pie crust while the pie crust is still warm. 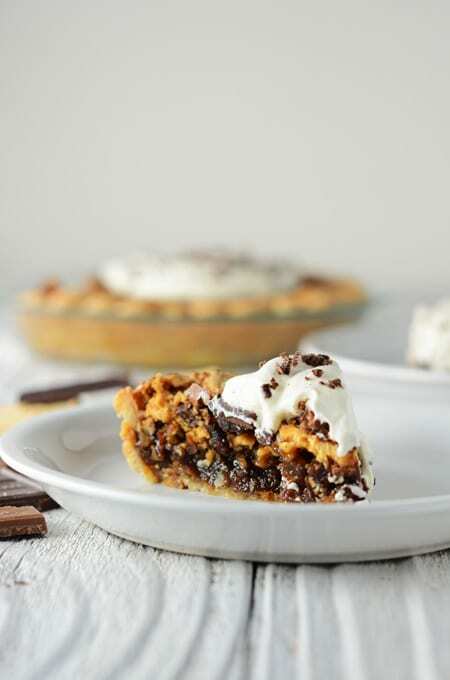 Dark brown sugar and light corn syrup give this pie a wonderful pecan praline flavor. And just when you think it couldn’t get any better, we add 3 types of chocolate to it! 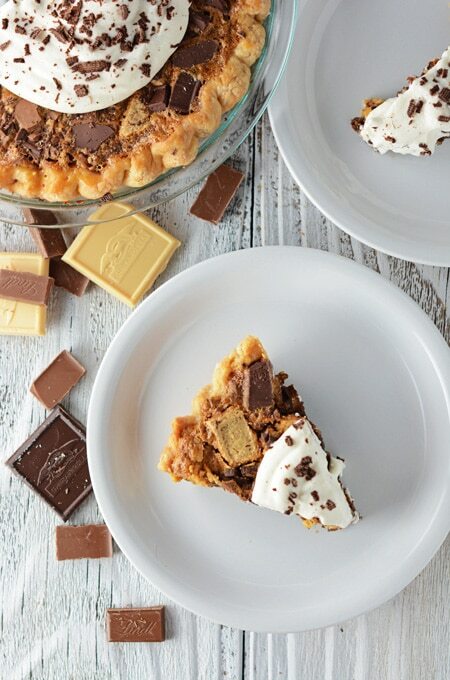 Semisweet, milk, and white chocolate takes this Chocolate Chunk Pecan Pie up a notch. 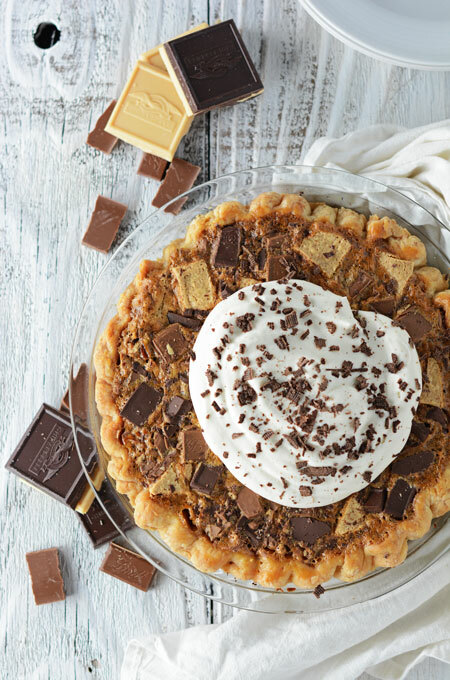 Homemade Whipped Cream or vanilla ice cream pairs perfectly with this pie. 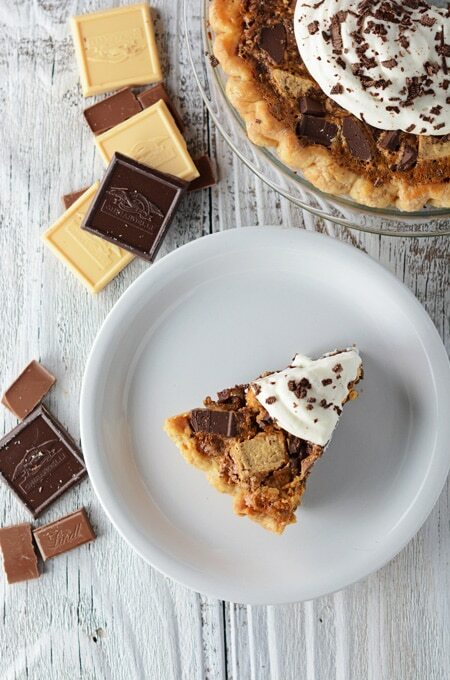 I don’t think this pie could get any better. It’s my new favorite and will be making an appearance at my Thanksgiving table this year. 1. Adding warm filling into a warm pie crust helps keep the crust from getting soggy. 2. Baking the pie low and slow helps keep the filling from curdling. Maybe you’re more of a traditionalist? 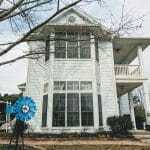 That’s cool, give this classic Pecan Pie a try. And don’t forget to follow me on Facebook, Instagram, Twitter, Pinterest and Yummly. Mix flour, sugar and salt in the bowl of a food processor, fitted with a steel blade. Scatter butter and shortening over the dry ingredients and pulse until mixture resembles coarse cornmeal, 10 to 15 seconds. Turn mixture into a medium bowl. Sprinkle egg white mixture over flour mixture and with a rubber spatula, fold down the dough. Continue folding dough over until the dough sticks together. Shape dough into a ball with your hands and flatten into a 4-inch disk. Lightly flour dough and wrap tightly in plastic wrap and store in the refrigerator for at least 1 hour or up to 2 days. Roll dough between 2 sheets of parchment paper into a 13-inch disk. Gently roll dough around your rolling pin and gently roll out dough over your pie plate. Press dough into the corners and sides of the pie pan, being careful not to stretch the dough. Trim the edges of dough to a ½-inch overhang. Tuck overhang dough under so that the folded edge is flush with the pie pan. Flute edges with your fingers or back of a fork. Refrigerate the pie shell until firm, about 1 hour. Prick pie shell with a fork on the bottom and sides. Line the entire pie shell with heavy duty aluminum foil, carefully pressing foil against the pie shell and extending over the fluted rim. Return the pie shell to the refrigerator while the oven is heating. Adjust an oven rack to the center position and heat oven to 400 degrees. Fill the foil lined pie shell with pie weights or dry beans and bake until the crust is set, about 15 to 20 minutes. Remove the foil with the pie weights and continue to bake until the bottom begins to color, about 5 to 10 minutes. Remove from the oven and brush sides and bottom with egg yolk and return to the oven until the yolk glazes over, about 1 minute. Remove the pie shell from the oven and set aside while preparing the filling. Lower oven temperature to 275 degrees. Melt butter in a medium heatproof bowl set in a skillet of just below simmering water. Remove the bowl from the skillet and mix in sugar and salt with a wooden spoon until the butter is absorbed. With a hand mixer, beat in eggs, then corn syrup and vanilla extract. Return the bowl to the how water and stir until mixture is shiny and warm to the touch, about 130 degrees. Remove from the heat and stir in pecans. Pour pecan mixture into warm pie shell and scatter chocolate pieces on top of pecan mixture. Gently press the chocolate into the filling with the back of a spoon. Bake until the center feels set but soft, similar to gelatin when pressed gently, about 50 to 60 minutes. Transfer pie to a rack to cool completely, about 4 hours. Serve with whipped cream or vanilla ice cream.